A fun and vibrant birthday card that I offered at my last Birthday Bash Buffet. Who can resist cupcakes after all? 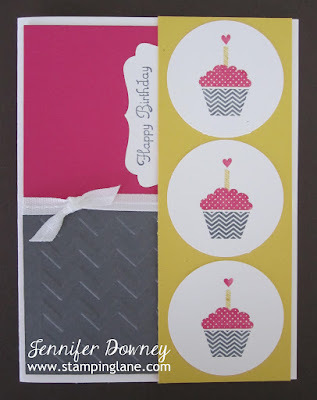 The cupcake is from the retired Sale-A-Bration set, Patterned Occasions and I used the greetings (inside and out) from the Create A Cupcake set. They worked perfectly for this card! This card could be easily recreated by using the cupcake images from the current Create A Cupcake set as well. Happy Stamping!